What an unusual combination - fennel with coconut. They balance each other out nicely, in fact. The fennel isn't so overpowering and seems to be calmed by the coconut milk. The crust is wonderful. Gluten free and uses brown rice flour and almond flour. No rolling needed, just press it into the tart tin. It held up perfectly for slicing, came out of the pan easily and tasted good too. 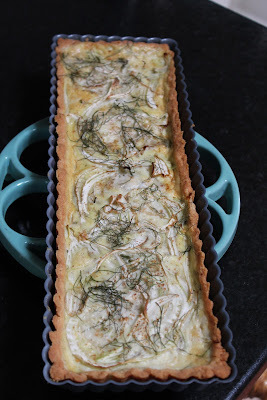 I decided to use my rectangular tart tin. I love the shape of it and it worked perfectly for this recipe. 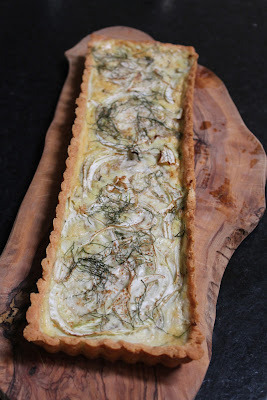 I think the tart looks quite elegant as a long narrow shape rather than the usual round ones. What do you think? It served 6 people nicely and the tin is 14 x 4 inches.